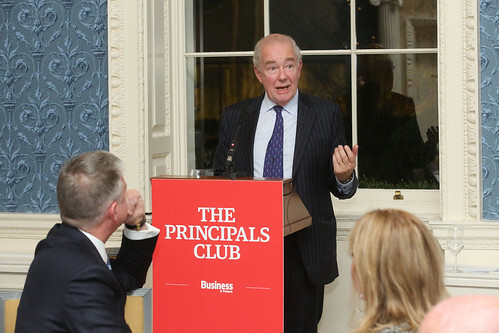 The Principals Club, an international gathering of C-suite business and political leaders gathered at the Merrion Hotel in Dublin last night to celebrate guest of honour, former President of the High Court of Ireland Nicholas Kearns. Principals Club Chairman Ian Hyland last night invited a select number of key leaders from business and political life to celebrate former President of the High Court of Ireland Nicholas Kearns. The guest list included Attorney General Seamus Woulfe SC, Minister Katherine Zappone, Deputy Michael Noonan, and Enterprise Ireland CEO Julie Sinnamon among many others. Opening the evening, Ian Hyland spoke about Mr Kearns’ many achievements over the course of his career starting with being called to the bar in 1968 and to the English bar in 1980. He was made senior counsel in 1982 and in 1998 he was appointed a judge at the High Court. In 2004 he was appointed to the Supreme Court. In 2009 he was appointed President of the High Court. Among many high profile cases, as President of the Special Criminal Court Justice Kearns presided over the trial of John Dundon for the murder of Shane Geoghegan. He was appointed Alternative Judge in the European Court of Human Rights on three occasions. He was appointed to the Permanent Court of Arbitration at the Hague. He is also Chairman of the Gate Theatre. Nicholas Kearns made an outstanding contribution to the Irish court system during his many years on the bench. His retirement was a significant loss to the Irish Justice system as said by Minister for Justice France Fitzgerald in 2015. Mr Kearns spoke about the new Maternity Hospital at Elm Park, which will be a leader in world maternal care, and which he says is ready for works to begin. He then spoke about soft tissue and whiplash claims and how Ireland as a nation awards far higher compensation than any other country in Europe. My other preoccupation has been with the Personal Injuries Commission. We presented our final report on the 18th September. This was looking at, effectively, are we paying too much for whiplash and soft tissue injuries in this country. Are we paying too much? Has the situation got out of control? What can be done about it? Following on from his speech, Nicholas Kearns answered questions from the guests including a question from Terence O’Rourke on insurance premiums, a comment from Attorney General Seamus Woulfe SC, and a further question from Catherine Guy, Partner, ByrneWallace Law Firm which led to a lively discussion in each case with Mr Kearns. Pat McCann is the CEO of Dalata Plc. He has had an extraordinary career over almost 50 years. He started with Ryan Hotels in 1969 before moving on to Jury’s Hotels and there becoming CEO. Dalata is Ireland’s largest hotel group with 8000 hotel rooms in its portfolio, and was listed on the Dublin and London Stock Exchange in 2014. Results released in February this year showed a profit before tax that had grown and increased more than 75% to €77.3 million while revenues in 2017 increased to €348 million. I’ve been very lucky in my life to have spent 50 years in the business of hotels. In Ireland we have seen a number of crises… but nothing compared to what we went through in 2008 to 2011. We’ve been lucky in that we didn’t waste a good crisis and we have taken full advantage of what was thrown up and we positioned ourselves well. We were a small company in 2007 when I set up and when we came out of 2011 we were the largest operator in Ireland – a position we’ve held ever since.